If you liked to play policeman/woman when you were a kid, chances are that involved running around with toy guns and shooting at your friends, rather than directing traffic or writing speeding tickets. Real police work might not be as exciting as you imagined it when you were a child, but fear not. According to Future Cop: LAPD, policework in the future is all about transforming mecha-robots armed with mini-guns and missiles and shooting first and asking questions later. Released in 1998 for Windows, Mac and Playstation to mostly positive reception, the game somehow managed to flop at retail. While the mass-market overlooked the game, retrogaming connoisseurs should definitely check it out, as it’s actually a well polished and frantically playable little blaster. Software rendering:- Uses only the power of your computers CPU to draw the graphics, bypassing your graphics card or chip. Lowest quality but best compatibility. DirectX rendering:- Uses the standard DirectX 3D acceleration modes. All modern graphics cards support this, though some users may find 3DFX mode works better. 3DFX rendering:- Uses the now obsolete 3DFX/Glide technology. While modern graphics cards do NOT support this, you can easily add support by installing a Glide wrapper. See “Running in 3DFX mode” under “Running the game” for more information. You can switch between graphics modes at any time simply by running the installer again. You don’t need to reinstall the game, just select the graphics mode you want to switch to and deselect all other options. The installer will also give you the option to “Update keyboard layout for 2 player compatibility”. For an explanation of what this does, see the section “Configuring controllers”. To download our replacement installer, click here. There were no patches released for the Windows game, though there was a 1.02 patch released for the Mac version. Depending on which graphics setting you chose when installing, the game should now run. If you choose 3DFX mode, you will need to follow the instructions under “Running in 3DFX mode” before you can start the game. Below are a few guidelines you should observe when trying to run this game. Check out the troubleshooting section too if you have issues while starting or playing the game. The game runs better when run as administrator – Future Cop saves its game settings in the registry. It uses a section of the registry that more modern versions of Windows keep locked down. That means if you don’t run the game as administrator, you won’t be able to save any of your preferences. Unless you need to configure the game for a child or a standard users account, always run it as administrator, either by setting the compatibility option to do so or by right clicking on the programs shortcut and choosing “Run as administrator”. Do not use a screen resolution greater than 1024×768 – Regardless of rendering mode, do not try to play the game in a higher resolution than this. If you do, it is likely to lock up or exhibit strange behaviour (such as not playing music and some sound effects, we kid you not). Skipping movies and cutscenes – Click the left mouse button to skip the intro movie and other cutscenes. 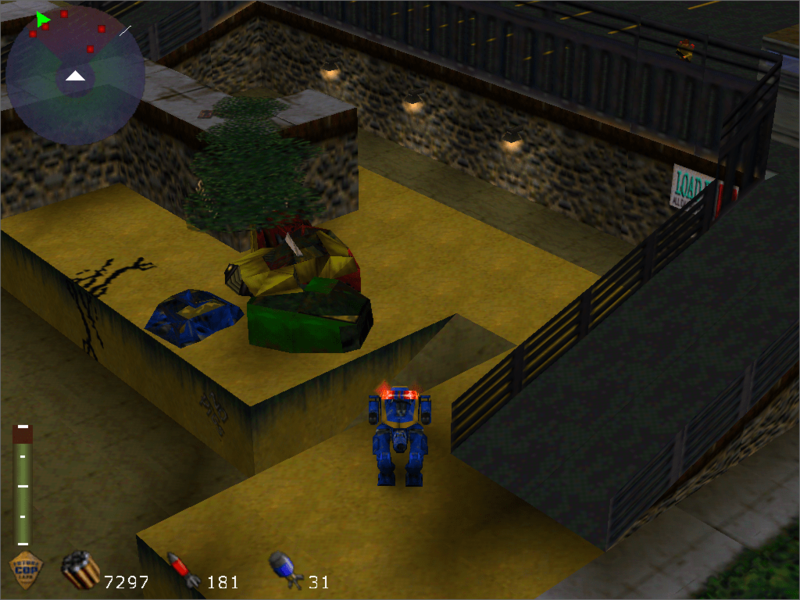 Running in 3DFX mode – 3DFX/Glide was a competing graphics standard that was around at the time the game was released. Once the cutting edge of PC gaming technology, the standard is now defunct and no longer officially supported. Nevertheless, 3DFX games are kept alive by software packages known as Glide wrappers. These programs translate the old 3DFX Glide games into something modern graphics cards can display. Normally when a game supports both 3DFX and DirectX we recommend you use DirectX. On some hardware however, Future Cop may perform better using 3DFX mode and the Glide wrapper nGlide. nGlide is our favourite Glide wrapper and the one we usually recommend for 3DFX games, you can download it here. Before you start Future Cop in 3DFX mode, there are a few things you need to configure in nGlide. Search for “nglide” on your Start menu or Start screen and click on the icon that appears. 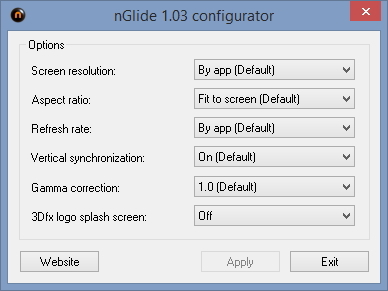 This will launch the nGlide configuration tool, as shown below. The two critical settings are “Screen resolution” and “3Dfx logo splash screen”. Do not try to force the game to run at a higher resolution than 1024×768. Leave this setting as “By app” and configure the resolution in-game instead (see Tweaking visual quality). Secondly, the 3Dfx logo splash screen needs to be turned off. Yes, we get those nostalgia pangs when we see it too, but unfortunately it causes problems in this game. With nGlide installed and configured you can now go ahead and launch the game in 3DFX mode. You can verify that 3DFX mode is enabled by going to the main menu and clicking on “Preferences”. 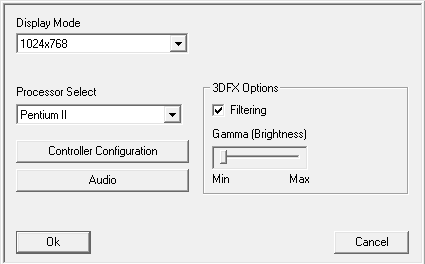 If 3DFX mode is working correctly you should see some additional 3DFX options for adjusting gamma. See the next section for how to configure the game for best visual quality. Unlike many PC games, Future Cop only has a couple of visual quality settings for you to tweak. Make sure you are running the game as administrator and then, from the games main menu, click on “Preferences” and the window shown below will then appear. Set the screen resolution to a maximum of 1024×768. Trying to go higher will just cause problems. The 3DFX options will only appear if you are running in 3DFX mode. You can turn on filtering and adjust Gamma (which affects screen brightness) to taste. Click on “OK” when you are done setting these options. We recommend that you now exit the game and restart it. This will ensure that the registry keys get written successfully. When installing the game, we gave you the option to “Update keyboard layout for 2 player compatibility”. Future Cop features a split-screen two player mode. While the default keyboard layout is fine for single player policeman, it’s no cop at all if you want to bring a partner along. By installing the updated keyboard layout you can play two-player easily. However, the original layout is possibly more comfortable for those of you who want to play the game alone. Reconfiguring the games controls in-game is tricky, in fact it didn’t seem to work for us at all. Fortunately, there is a file in the games directory called “controls.txt”. By editing this file you can easily remap the controls. Unfortunately, when editing this file there’s no indication of which control does what. To make things easier, refer to the table below. As long as you edit the controls.txt file and keep to this order, you can remap the controls however you want. If you ever want to go back to the default controls, simply delete the “controls.txt” file and the game will then create a new one the next time it is run. 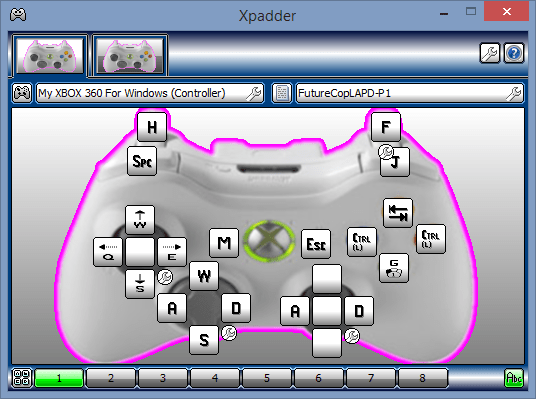 To play with gamepads you are going to need Xpadder, which we will come to in a moment. To get the game working with controllers, we used our old friend Xpadder. Of course, if you want to play two player, Xpadder supports multiple controllers. Here’s a picture of our Xpadder profile for the game. We originally created a layout based on the controls in the Playstation version of the game. However, this game pre-dates analogue controllers and so was configured for the original, digital only Playstation controller. This didn’t map as comfortably onto the Xbox 360 controller as we anticipated. We have therefore redesigned the layout to more accurately emulate the kinds of controls you’d encounter in a more modern third person shooter. Notice that we’ve also added mouse movement onto the left analogue stick, and a mouse button click onto the A button. This allows the menus to be navigated without reaching for the keyboard. The game can also be paused by pressing the Start button. The only time you will need the keyboard is when you save your game, as you will have to then enter a name for your save game. You could always use a chatpad as per the tutorial here if you want to avoid this. Remember that if you are running the game as administrator, you will need to run Xpadder as administrator too, else the inputs will not be detected by the game. As well as local co-op, the game supports a kind of tower defense/deathmatch type game called Precinct Assault. While the servers that let you play this over the internet are long gone, it’s possible to host and join your own games on the LAN or even online. Playing online may require you to reconfigure your router, though playing against an opponent in the same home should be somewhat easier. We did not test the network multiplayer options, so if you do get them working on a modern PC, let us know in the comments. 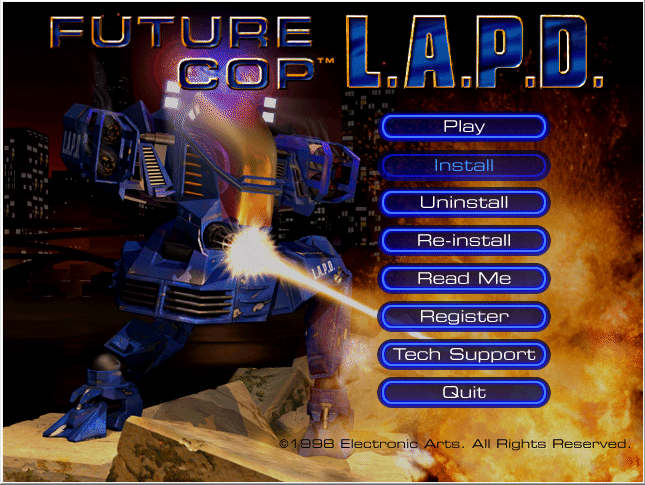 For such an old game, Future Cop: LAPD runs very well on modern hardware. It is not without its issues however. Here are the issues we encountered when playing and any possible solutions we found. Audio and music not playing in cutscenes and/or only partially in game:- This can happen if you set the games screen resolution higher than 1024×768. We’ve no idea why. This can also happen if you are using an optical or HDMI sound card. To cure the problem, turn on Dolby Digital encoding if your card supports this. Users running graphics cards with HDMI audio output should not be affected. Cannot Alt+Tab out of the game:- If you try to nip back to the desktop to check your e-mail or whatever, the game is likely to simply crash or just not let you switch back to it. Currently there’s no workaround to this other than to play in window mode which is only available when using software rendering mode. Cannot see menus:- Can happen on machines where Stardock Windowblinds is installed. Add “FCopLAPD.exe” to the list of programs excluded from skinning in Windowblinds. Corrupt graphics in game:- Happens on some machines when using DirectX mode, switch to 3DFX mode and use nGlide. Invisible electric fences in 3DFX mode:- You will encounter several electric fences when you play the game, including several on the first level. Watch out if you are playing in 3DFX/Glide mode as these fences may be invisible. They still drain your shield if you hit them though! It’s fairly obvious where the fences should be, so just keep an eye out. Invisible pause menus:- Sometimes when the game is paused, all you will see is a white screen instead of the pause options. Currently there’s no known fix/workaround. Try not to pause the game too often, go take a leak before you start the next level! Lock-ups or crashes when loading levels:- This was the most frustrating problem we encountered. Sometimes the game simply locks up when you go to load a level. If this happens to you often, try logging out of all other user accounts and shutting down as many programs as possible. Screen blanks when starting a level:- The game runs its cut scenes at a different resolution to the main gameplay. Back in the days of CRT monitors this didn’t matter, but some more modern displays (particularly HDTVs) take a few seconds to re-display the picture after a screen resolution change. This can leave your mech vulnerable at the start of the level while you wait for the screen to come back. There’s no real workaround for this other than using a different monitor. Screenshot taken at the start of level 1 running in DirectX mode. Click the picture to see a bigger version. Hey thx for that but i can’t run the 3d setup cause error game registery key ..
Did you use our installer to install the game? Thanks a lot. By the way, I would like to move the player with arrow keys, but I don’t know what shoild I type instead of NumPad8/W to get the arrow keys work. Help. Honestly I’m not sure either, maybe another reader can help? the new installer for Win7 64bit is really great, it works on fine my Computer! Thank you for uploading this, I loved this game till the end. I can’t seem to find the controls.txt file. Is there another file I should be looking for or is it impossible to change the controls now? 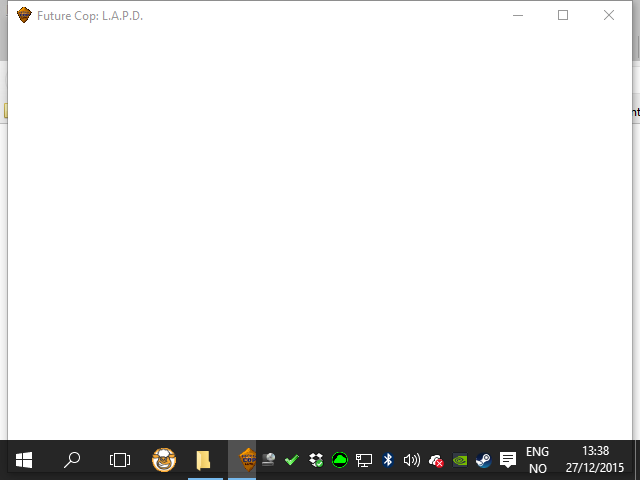 Should be in the games directory, C:\Program Files (x86)\Electronic Arts\Future Cop by default. Can’t think why it wouldn’t be there. I tried to install it with my french CD, and when I launch the game. I have a little window: the Electronic Arts video works and then the app is auto-killed. Even s admin. I can give you a rip of my disc if you want. What version of the game do you have, what region? You do have your game CD right? This isn’t a warez site, you need your original game CD. I have the similar problem like “jedi-cxt”, as mentioned above. When I launch the game. The game starts in windowed mode: the Electronic Arts video works and after 1 sec of the next intro, the game crashes without any notice. Even as admin. I Run Windows 7 32bit with AMD graphics…. i got it working… thanks for the nice posting! Care to share what you did to fix your problem? “I got it working now” type posts aren’t very helpful to others. i cant find preferences in 3dfx, where is the location??? Run the games installer again to access the settings/preferences. I can’t seem to configure the controls. It keeps saying access denied, is there a way to go around this? Is there a way to play Future Cop on Win10 64′ ? I’ll look into that when I get chance. Goodie. I will be here to reply. 3. I have not tried any virtual winXP program, I hear XP mode doesn’t work for win10, but I will try VirtualBox or something later. 4. I have tried various compatibility settings, but I’m not sure I’ve tried everything yet. I did not try virtualBox because it require a disk and a WinXp licence, wich is too much hassle if I want to show the games to others aswell. I have to rely on you to improve the installer, if possible. Or wait until Microsoft adds a virtual xp mode, if they plan to. Please advice where to get original CD? Is there a way to download the game and use your insaller for a downloaded game? Amazon or eBay is your best bet. Any chance on updating the installer to work with Windows 10 64 bit, loved the game so much. It’s not working for you? What goes wrong? What I meant to say it goes straight to credit screen at end then shuts down. I left it with software rendering so what is the best thing to do, use dgVoodoo2 with what? Odd. Try dgVoodoo2 in DirectX and Glide mode. Have tried both of those, DirectX just gives a white screen, Glide mode gives the same with a small screen running the credits at the end of the game. Same issue here on our Windows 10 machine, looks like this one’s not going to play ball on Windows 10. Well I downloaded the updated version of ORACLE VMware, with Guest Additions and VirtualBox Extensions pack, used nglide and now have it running without any crashes running XP in VMware on Windows 10 64 bit. The last bit to sort out is my game controller and then its done! So for anyone else wanting to play this on Windows 10 64 bit that’s what you need to do. Just gotta sort my game controller out !!! Thanks for the tip. I had a little play and got the game going today in 10, I used both dgVoodoo2’s DirectX and Glide components. It worked, but cut-scenes don’t work at all. Shame, as VMWare’s not as convenient as running it native (and no Glide support of course), but at least it can still be played. Still having problem with VMWare, game launches but besides getting a game controller to work, even the basic keyboard controls don’t ! Any ideas ………..? Well I now have it fully running in Oracle VM VirtualBox, with GuestionEditions and Extensions installed under XP. Unplug your USB Device then plug back in and the VM Host will then pick it up and install the necessary driver and all should be good. All the cut scenes, narrative, music, etc. work fine. So for anyone who is a fantactic for this game can enjoy! Ok, which version of the game are you trying to install? I get a black screen once the game starts.. and it does not go away. I have tried on VM with windows xp and VM with windows 7 using your installer. We can’t get it running well in Windows 10 either. It’s a shame it doesn’t work. I could seriously see myself playing this on win10 in coop mode with my gf. I love the colors and graphics in the game. A remake would be awsum but perhaps my gfx card can render some edges a little better than what I remember from the old days. There are MANY older games that work great in Windows 7 & 8 that refuse to work in Windows 10. Could be how Windows 10 handles DirectX, but not even dgVoodoo (which has a DirectX emulator in it) does not help. If you are going to do a lot of retro Windows gaming, Windows 10 is really just terrible. Windows 7 64 is the absolute best OS and is fully supported until 2020. Go back to the light side of the Force my friends! That’s not been our experience at all. I can only think of a couple (this and Bug) that really struggle in Windows 10 and Bug wasn’t exactly Windows 7 friendly. It’s not working in Windows 10. I have tried upto the final step where we change prefences icon in start. After that the game freezes and I have to restart again. I have the game working but it’s not responding in Windows 10. Whenever I change the prefences the game freezes and there is no sound….. Disappointed with Windows 10…. 7 was better. Why did they upgrade…. This is my favourite game and now all I have to do is stare at my CD . ISO file…. Guys do you have any ideas…. Someone check for Windows 10…. Patch for Wndows 10 found! English game release required (my french cd release is unpossible to play, crash after EA video, but I was able to transfer the french audio), Native output from 64bits installer, add 3DFX dgvoodoo2 ddls to the main game, then set the exe to “Windows 98 / ME” mode and admin compatibility. All will play fine, including the game options, except the movies which remain black and keyboard need to be configured from the text files. The MAC port seems to be the best, they fixed left+weapon1+weapon2 together trigerred while on PC, the bot is getting stuck in his move… Any ideas to fix that on Windows? Hi, I got Future Cop working on Windows 10 and it’s great, but after several minutes of playing, I’ve noticed significant slowdown even though it’s a really old game that should work flawlessly on Win10. Is there a workaround for this? Any help would be appreciated. Also, can you get Driver, the first game in the Driver series, to work on Windows 10? Driver runs natively on Windows 10, just exec the config exe as admin, ok and the game as admin. For the audio, you need some CDDA fix to do. I have some issues with diagonal UP+Left or Down+Left command in-game, sometimes it get stuck while using the weapons. Thanks! Thanks for uploading the installer, BuckoA51. The last time i played this great game on PC was… a few years ago, and with Win 7 if i recall it correctly. Don’t remember any prob with install or play. Things changed with Win10 and 16bit executables doesn’t work anymore, but still, i tried D3D config and to run it on Win10, you need to use Win98 compatibility and then select reduced color palette (16 bits). Options are very buggy, especially sound related ones. You can’t switch to window mode either, 640×480 only in my case. I can only hear sfx sounds unfortunately :( Hope to see this game on GOG some day. Seconded. I played it before on 7 and things were all OK. Now Windows 10 is more problematic. It plays however the pop-up menus are funk. Trying to open controls or audio settings will make the preferences window un-closeable. Sounds effects alone work. However audio settings shows all sounds are OFF.